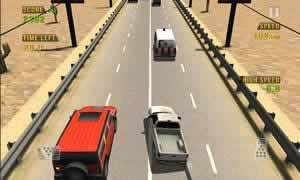 See How Long You Can Survive While Burning Rubber in Heavy Traffic! When someone tells you to go play in traffic, they’re not being very nice. With Traffic Racer, that no longer has to be the case! Pick your favorite type of car, pimp it out, and take it on the highway at the most unsafe velocities you can handle. Deftly steer past cars in ongoing traffic, drive on the wrong side of the street, play chicken with the biggest trucks you can find, and see how long you can survive once you’ve thrown common sense out the window. There are no traffic safety laws, signs or police to find here, so prepare to go hog wild on the street with your favorite mobile device. In Traffic Racer, you get to choose the road conditions you want to deal with. No matter what your level of skill is or what kind of challenge you’re seeking, this game has the options to accommodate you. Play three distinct game modes: Endless, Time Trial and Freeride. Choose between one-way and two-way traffic. Drive on a variety of roads, including suburban, desert, snowy and nighttime. Forget everything you had to learn in order to get your driver’s license. Traffic Racer is all about driving as hazardously as possible. Ignore the speed limit, the rules of the road, and the presence of the cops. Laws are only meant to be broken in Traffic Racer. 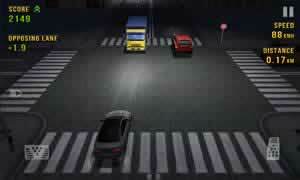 Tilt your device to steer your vehicle. Step on the gas pedal and the brake by hitting the onscreen buttons. Dodge consecutive vehicles without ever slowing down to rack up a combo and get more points. Increase your score at the end by driving as far as you can, maintaining ludicrous speeds, and driving into oncoming traffic. Don’t crash. Otherwise, it will be game over for you! Earn money from your excursions and use it to unlock all sorts of goodies. 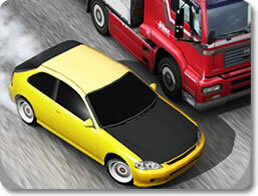 Traffic Racer boasts numerous vehicles that are just waiting to get involved in an accident. Take your favorite car for a spin and send it to the scrap heap! Drive over a dozen vehicles, including pickup trucks, four-door sedans, and speedy sport cars. Upgrade your ride’s speed, handling, wheels and paint job. Unlock new cars with the in-game currency you earn through successful driving. If you want a fast-paced driving game that encourages you to drive skillfully and badly at the same time, then Traffic Racer should easily be up your alley. It has speed, responsive controls, rampant customization, and plenty of opportunities to joyride without winding up on the local traffic report. Get on the virtual highway and slam down on the pedal with Traffic Racer right now!